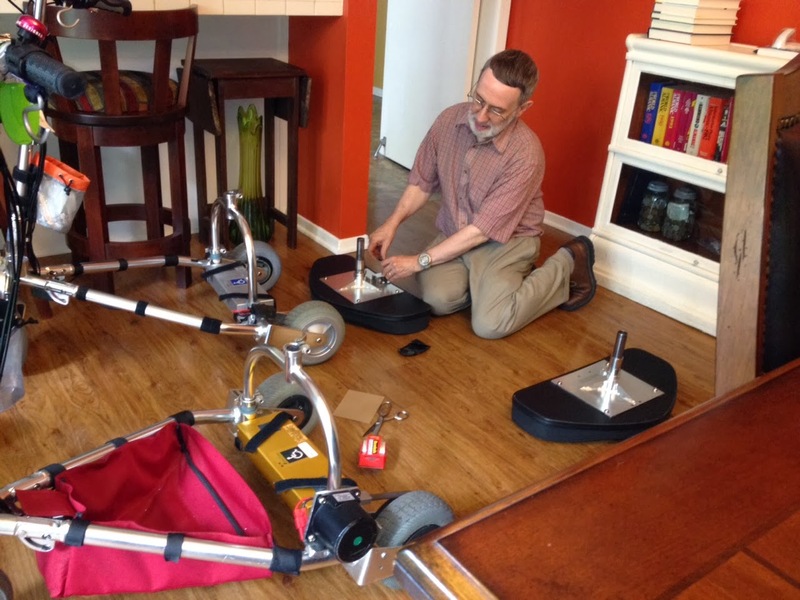 Jim from Australia is impressed with the new TravelScoot! 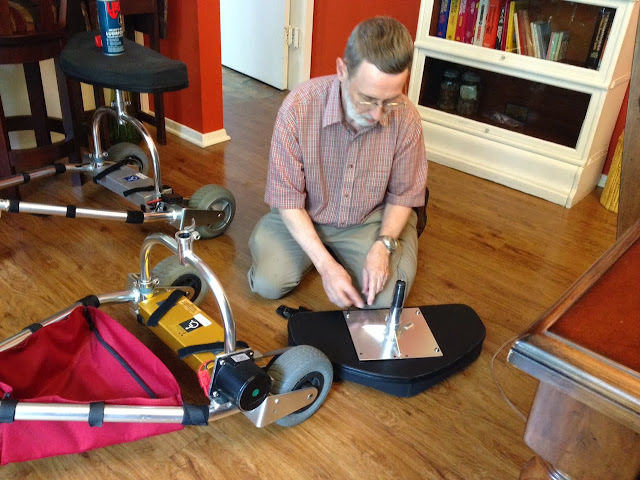 Jim from Australia shared an email he recently sent to Hardy Huber (TravelScoot's inventor) about the new model. You must be very proud of your newest creation! Mine arrived last night, but I didn't get to use it until today. The controller function is brilliant! No sudden take-off from start. No sudden take-off from slowing down. The brakes are a great improvement - easier on people with weak hands like me. And all the little finishing details - the easier battery plug, the easier charging in place, those hard plastic protectors for the cables and electrics, the neat hand grip and throttle, the clear motor power LEDS. 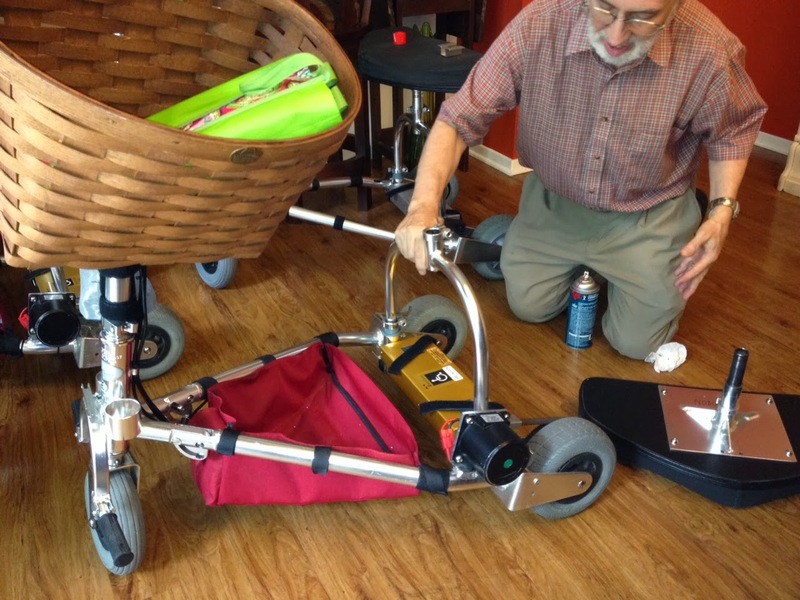 To all this add a motor with no belt, and still the lightest portable scooter on the market! Many, many thanks for the time and trouble you have put into this design. I’ve had my TravelScoot now for about four months and am delighted with it. What I looked for was something different from most scooter buyers. I don’t have a car so I needed it to handle ordinary pavements and to travel on public transport, including British mainline trains, which I will return to as the info may be useful to anyone visiting this country. 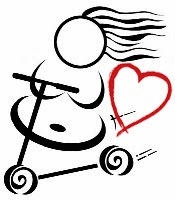 I have COPD which means I cant walk very far without stopping for breath, but I am otherwise fairly fit, with the lower body mobility to sway in reaction to any lateral slope of the ground. The only serious problem I have had is turning left on an uphill slope, so I get off and push. I initially tried another make which folded down very quickly and stayed in one piece. However it had three problems. One that it had very little ground clearance and weighed about seventy pounds. The main problem however was that, with the necessarily high centre of gravity, its narrow wheelbase made it dangerous on uneven pavements. The wider wheelbase and the lighter weight of the TravelScoot therefore made it the obvious choice - the only problem being that when folded you are surrounded with bits and pieces. The solution I devised works fairly well. 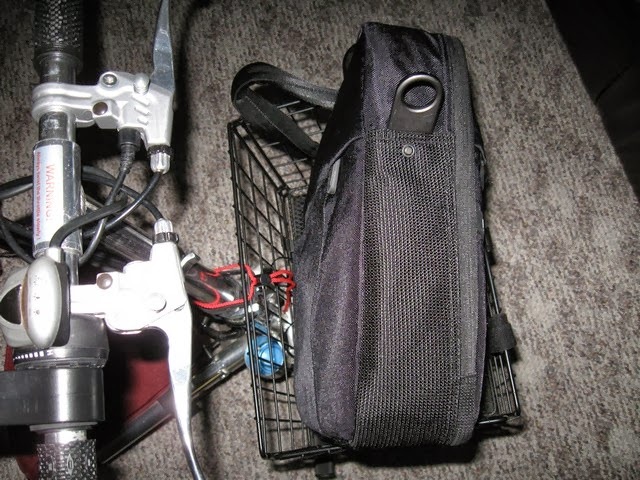 I have bought a 23inch (internal measurement) sports bag which takes the seat, crosspiece, canvas sling and the battery. This I sling over my left shoulder with my shopping bags in my left hand and carry the frame with my right. I can manage this for a short distance. The longest trip so far was from my home town of Belper to a COPD meeting at Nottingham, involving travelling by train, tram and bus. Talking them in reverse order, practically all buses in Britain apart from long distance coaches have low floor entrances and space for wheelchairs. Generally these are in demand by mothers with enormous push chairs so I usually fold the TravelScoot up. In this case however it was the hospital bus, which I guessed would be used to carrying scooters, and a very short journey, so I carried it aboard without folding it. The tram car was dead easy. A number of large cities in Britain now have tram networks and the platform of the tram aligns exactly with the pavement with a very small gap. You can simply drive on and off. Now we come to the train. 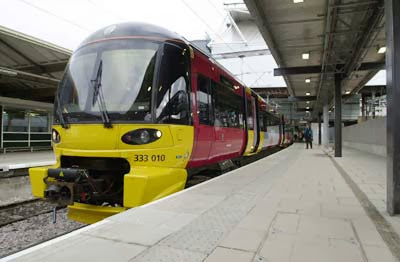 Train services in Britain are operated by a number of different companies with different conditions. This is two hundred year-old system and not all of it has been brought up to date because of the sheer expense involved. Not all stations are accessible, platform heights vary, there are different classes of train with different degrees of accessibility. Generally with a wheelchair one phones the different companies the day before and they will lay on help. 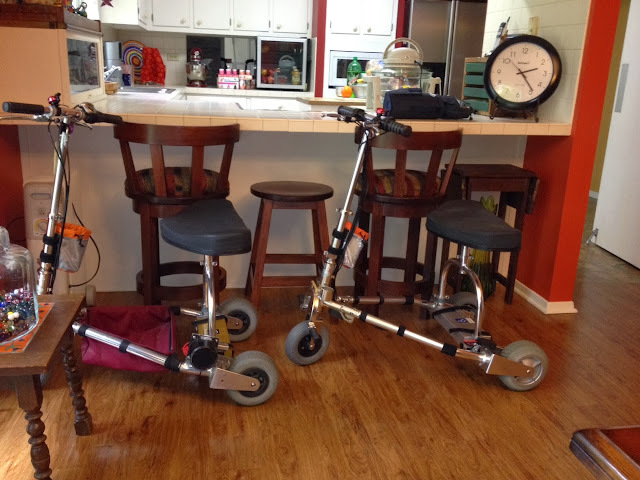 However mobility scooters are a different matter because of the range of different types and sizes and they may not be accepted at all. The biggest problem you’ll find is the interest it arouses when you set to work opening it up or folding it, and being held up chatting about it. Having had freedom restored by the purchase of a Travelscoot we had really been looking forward to going to the new Rijksmuseum in Amsterdam. 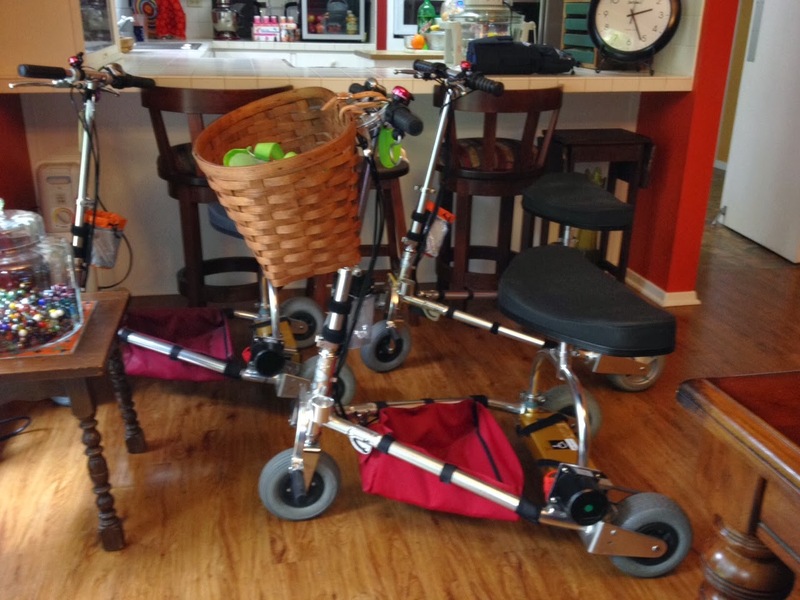 Luckily just before buying airline tickets and booking hotel I noticed a tiny small print sub page on their web site that said that mobility scooters were not allowed. I presumed this meant big on roaders as they allow pushchairs and electric wheelchairs but after contacting various bodies I am still stuck with the reply below. Probably will not affect too many users but I am concerned that this might be more general than I think. Does any one else know of places the scoot might be banned from? Please accept our apologies for not answering sooner. Unfortunately it is not possible to visit the museum using a travelscoot. We have looked into all the possibilities but it is not safe. How easy/not easy is it to add the front and/or rear baskets to the 'Scoot? And how far do they extend the length of the whole thing? I'm thinking bout ordering them to make shopping easier, but they'll probably need to come off to get my TravelScoot into my car, so on and off need to be simple enough to be done while standing behind the car even in lousy weather. 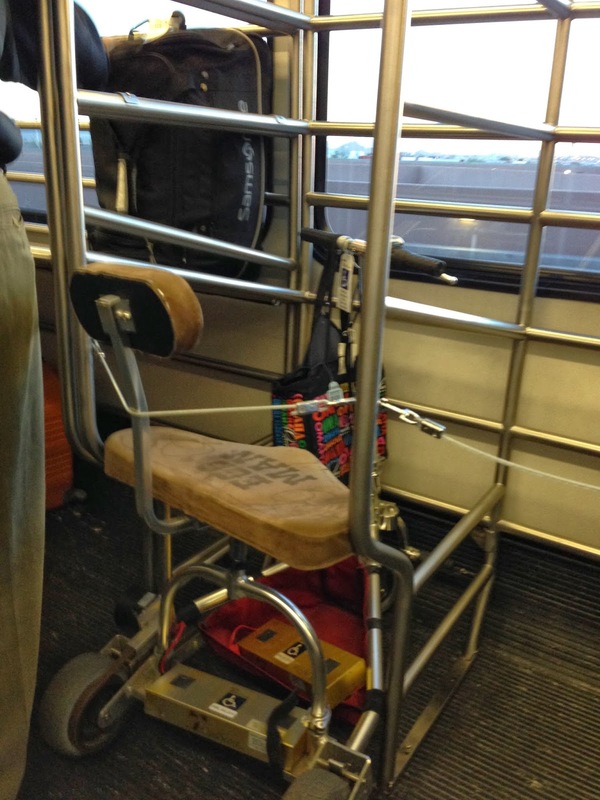 This picture is from Dean, and he and his TravelScoot are riding the bus at the Phoenix Airport. He says it almost looks like they planned for the TravelScoot. I agree! I had breast cancer last year and multiple myeloma this year so I figured out that a positive attitude is all I can control. The TravelScoot has been a GodSend for me. I can walk but not long distances. My kids are rewarding me for cancer treatments with a land sea trip to Disney World in June. I will take my TravelScoot for the ship. I too have had creaky seat syndrome .... it took a while to find exactly the source of the creak, partly because the noise resonates through the wooden seat making it difficult to pinpoint ...... but after a while & using a screwdriver against my ear it became obvious what it was. The pillar underneath the seat (the one that slides & clamps into the top yoke fitting) had moved slightly & the top of it was rubbing against the metal bracket under the seat. 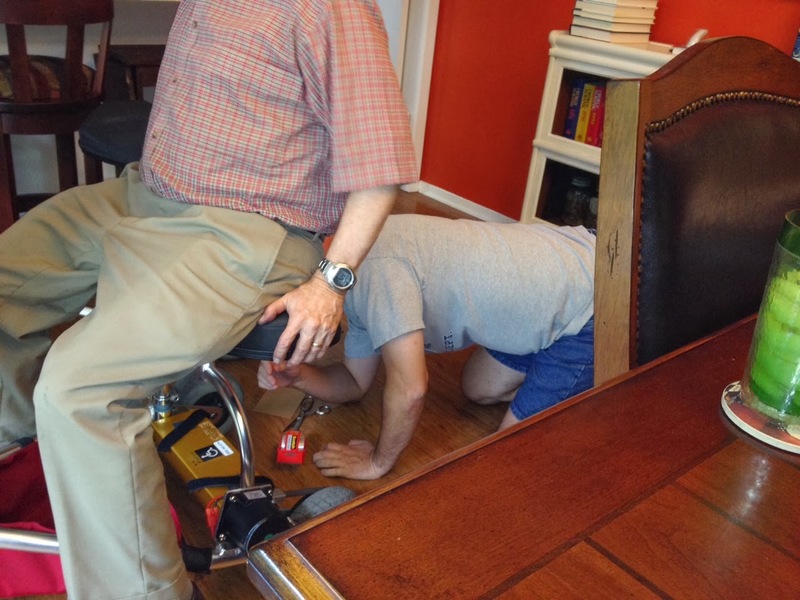 - Just take the seat off & loosen the hex nut that clamps the pillar to the underside of the seat. - Extract the pillar, cut a small piece of rubber to match the internal circumference of the tube that the pillar slides into & slide it down the the tube. - Push the pillar back in to the tube, but don't let it go right to the end stop, then tighten the clamp as tight as is humanly possible. The offending seat pillar takes the entire weight of the rider & over time will slip till it reaches the end of the tube, then it's metal against metal & will creak ..... unless the piece of rubber is in place to stop that happening. If done properly it'll be a permanent fix. As a footnote, I've always found silicone grease to be the best lubricant -- not much money & found in your local plumber store. 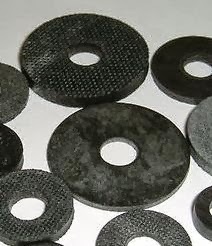 Sheron says he used a standard thick rubber washer with 26mm OUTSIDE DIAMETER (that's a fraction over an inch) and they were an absolute perfect fit. They're showing the 26mm Outside Diameter are out of stock. No problem, the 25.5mm will do just as well. I had the same trouble with noise coming from my seat on my TravelScoot about 2 years ago It was terrible when I was in a small place like a lift. After a lot of searching I realized it was coming from below the yoke. I cut some flat rubber the same size as the tube of the yolk, and then placed 2 pieces, one under each tube. Peter replied that the rubber he used was about 1/8" thick from an old motor car tire. He said you should be able to get some from a Motor tire repair shop, but any old thin rubber should be okay. I recently received this email from Margaret. Big welcomes to Margaret, and I know I'm not the only one looking forward to hearing about her adventures! My friend Melissa has been having a problem with her seat creaking since she got her TravelScoot, and we've just never taken the time to diagnose the problem and fix it. Last weekend we held a "scooter clinic" at our house to fix the problem, and I thought you'd enjoy reading about it. Alan, my 'scooter wrangler', is trying to diagnose what is causing the creaking. We couldn't tell exactly where the sound was coming from, but me, Melissa and Greg were all putting in our two cents on how to fix the problem. The seat is off and Alan is lubricating various parts that might be contributing to the problem. He uses LPS2 for lubrication. Hardy Huber told me once that he uses vaseline but Alan's an audiophile and has the LPS2 for his audio equipment. It seems to work great on the scoot too. This is Greg on the floor, trying to see if he can hear where the creaking is coming from. So far the lubrication isn't working. 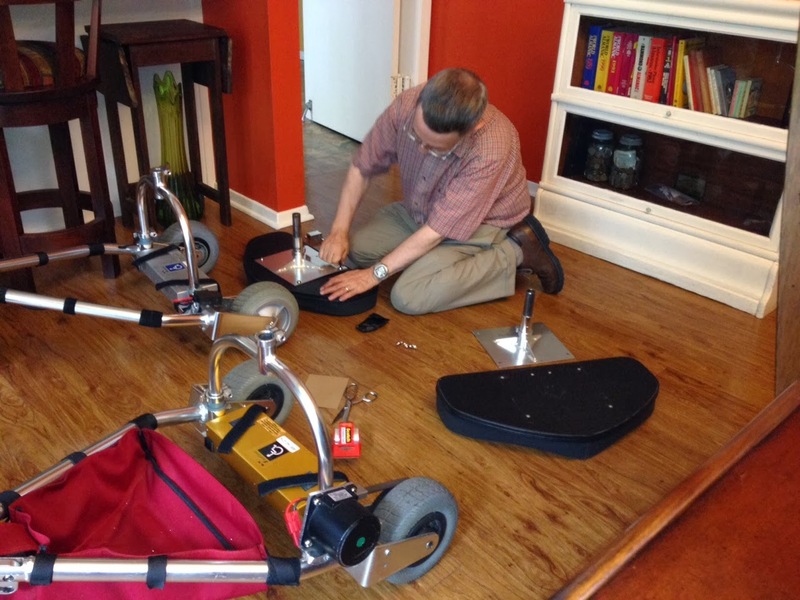 One of the things Alan tried was swapping out the metal parts on 2 seats, to see if the problem was the seat itself. It wasn't. Here he is putting the correct metal part back on the correct seat. The solution for this problem ended up being that the clamp at the top of the yoke (that's the curved metal bar over the battery) needed to be loosened AND it needed lubrication. After Alan did that we had a very quiet seat, and a very happy scooter owner! Thanks for starting and keeping up the blog. That's how I found and fell in love with my Scoot. I've had my basket on the front for years. It recently got hit and the bracket broke off. I either have to get it welded (or otherwise fixed) or put it on the back instead. I see Mary Ray has hers on the back. So...here's my question(s): Does it make it more difficult to get to the battery to remove it for charging with the basket there? And does the basket swing around if it is only tied down in one spot? If the answers are no and no, I may try it. I wanted to share a photo of my latest adventure with my TravelScoot, the South Carolina State Fair. 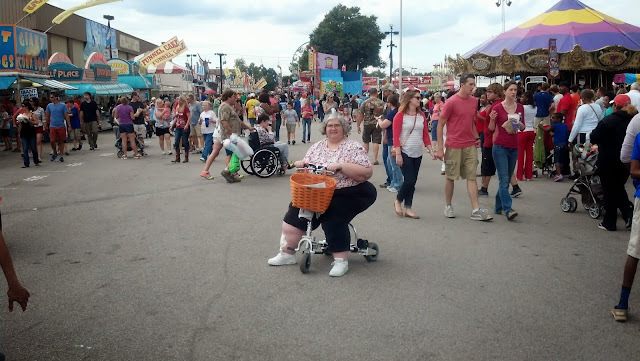 Thanks to my Scoot we were able to see the entire fair without having to stop every time we saw a place to sit. I even got to enjoy my once-a-year treat of a deep fried Snickers bar. 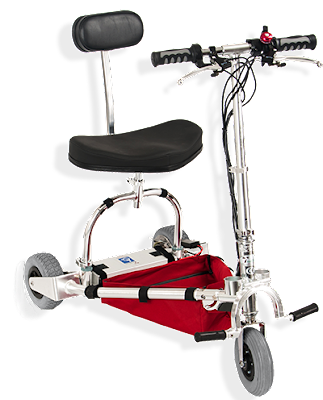 Now, I have a question - does anyone else's scooter creak and pop? It makes me nervous when I'm riding it. Is this normal? I've checked it over and can't see anything that would cause this. 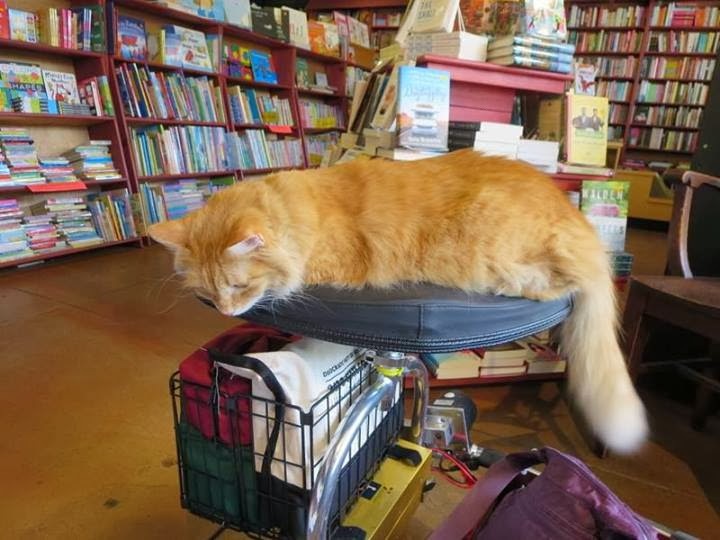 This is Bob the Cat, whom I first saw in the window at Recycle Bookstore in Campbell, California (http://recyclebookstore.com/cats.html). I went in to greet him because, of course, I was missing my cat (Smudgie the Cat), who was bravely guarding the home territory while we were away. Bob came right over to me, nuzzed my proffered fingers, purred very loudly, and jumped onto my scoot in hopes of going for a spin. Turns out he has a habit of trying to hitch rides in strollers, too! Many thanks to you, Bob the Cat, for the much-needed kitty fix! — in Campbell, CA. This is also a good photo of a back basket. It's attached with a yellow cable tie. 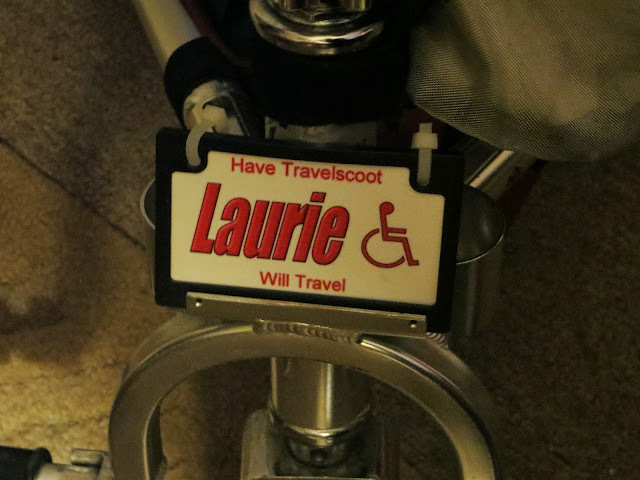 I just wanted to share a photo of the license plate I have on my TravelScoot. I just got back from a trip to South Africa and my scoot went with me on safari!